Field of view. The Arlo camera has a wider field of view of 130 degrees whereas the Canary is only 116 degrees. Storage. With the Canary, you only get only 24 hours of free cloud storage. For extra security & storage, you must upgrade to Canary Membership. The Arlo Pros is a step ahead of its competitors in this regard. Here’s why: You don’t pay for cloud storage. You get seven days of free cloud storage recordings. This is thanks to the USB storage back up. Smart alerts. They both function via their respective mobile apps. You’ll receive notifications through your smartphone thanks to the motion detection system. However, the Canary takes slightly longer to alert. The Arlo has more advanced sensors so it notifies you immediately. Resolution. 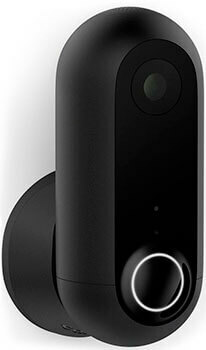 The Canary has a higher resolution than the Arlo, having live streaming and video recording capabilities of 1080p while the Arlo records in 720p. This means it has better picture quality during the day and also provides better night vision. The Arlo Pro’s picture quality is affected by weather conditions and often records in pixels when it’s windy. Emergency Services. Both cameras allow you to contact emergency services when necessary. The only difference is with the Arlo Pro this feature is optional and you’re given one free trial month. Siren. The Arlo model has a smart siren that you can control remotely. It’s also activated when sound or motion is detected. Unfortunately, the Canary doesn’t have this feature. Remote viewing. With both cameras, you can view recordings on your mobile phone. However, the Arlo also allows you to view via web. Installation. 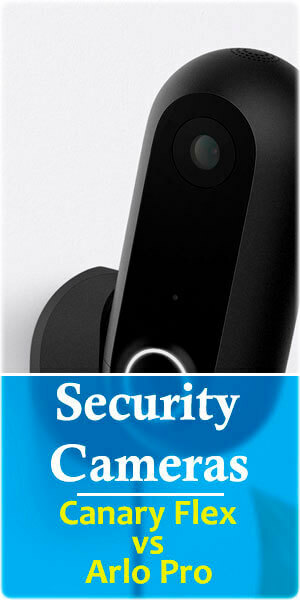 Both are wireless security cameras for hassle-free installation. However, the Canary also gives you the option to plug it in. Also, the Canary is easier to set up compared to the other model. Customer Care. Both cameras are covered by a one year warranty. However, you’ll experience better customer care with the Canary’s service providers compared to the Arlo’s. Apart from the fewer complaints you get assistance free of charge. Unfortunately, you have to pay a fee for each call with the Arlo. Looking for a versatile security camera? You’ll like this one which can be placed either indoors or outdoors depending on your preference. In addition, it can be plugged in or operate wire-free. It records in HD so you’re guaranteed clear images whether day or night time. It’s powered by artificial intelligence. As a result, it sends an alert to your phone if it detects persons or irregular activity. However, some customer reviews show people have experienced delays before the alerts are sent. By the time you want to view the live feed, it’ll be too late. This camera is pretty useful in times of emergencies. It’s loaded with numbers for first-time responders giving you quick & direct access when needed. However note: You’re the one who has to alert the desired authorities not the camera. It automatically switches on & off when you come and go. This is thanks to the Smart arm or disarms feature. The Canary has four main modes: Away, home, night and privacy. All of them are activated & deactivated via geofencing. The built-in privacy mode allows you to shut down the camera & microphone any time you want. Here we have a weather resistant camera meaning you can use it for outdoor and indoor scenarios. Every angle in or outside your house can be covered thanks to its wider field of view. It’s free from wires and power cords. This allows you to place it anywhere in your home. Like the Canary, it also features a two-way audio system. The built-in Mic and speaker allows you to listen in or talk back when necessary: Simply enable the push to talk functionality. This device also relies on a mobile application. You can easily view live videos with just a simple voice command on your phone. It works with various online platforms including Samsung Smart Things. It also allows you to contact emergency services from your SmartPhone’s lock screen. This camera is designed to customize alerts when people or suspicious activities are detected. The only problem is there’s a delay between when the motion is detected and when it starts recording. The Arlo has a longer battery life compared to the Canary, lasting anything between four and six months. However, it’s only powered with its own specific battery. This means off the shelf batteries won’t work. The Arlo has a wide Wi-Fi coverage. It’ll function effectively from as far as 250ft which is pretty impressive. 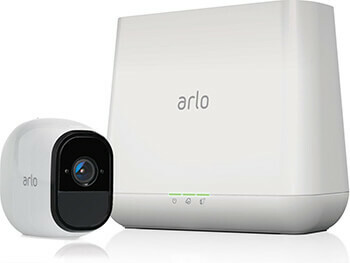 Canary Flex vs Arlo Pro: Which is better? We’ll have to go with the Canary. Apart from its security features it has more advanced capabilities than its competitor. We like that the health home technology feature is integrated. This means you’ll have a thermometer, humidity and quality sensor—all in one package. The built in battery is also a convenient feature. Not only does it work during a power outage but you don’t have to charge it as frequently. The next time you’re in the market for a versatile security camera, why not add it to your shopping cart?